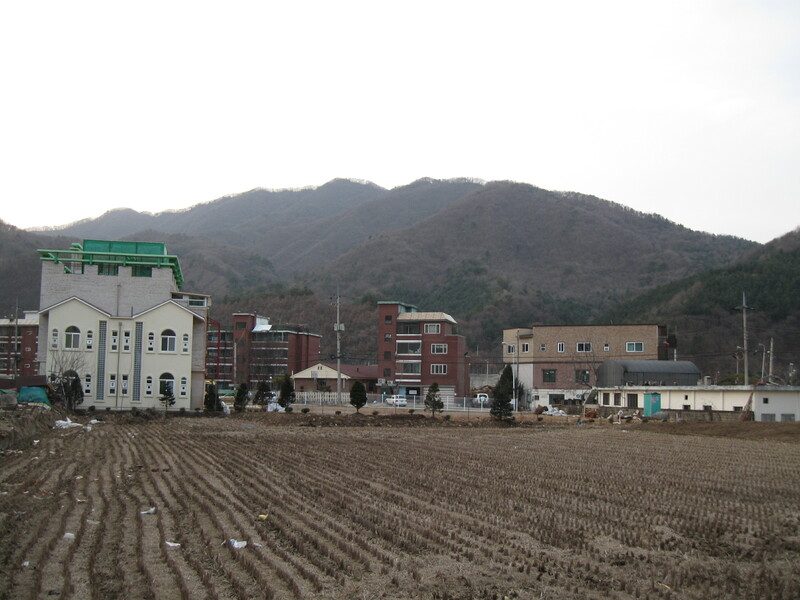 Country life – Hello Korea ! In between a lot of buildings are little rice paddies. (quite a lot of junk has blown in amongst the dried out stalks of last year’s harvest, though, making the area look a little depressed) I hear this area is famous for its grapes. Since 90% of the students here won’t be going on to college, I asked what kind of jobs they can get in the area, and many of them will probably go and pick grapes, it turns out. Because the weather has been on-again off-again still winter, the crops are a little late going in. Some of the little fields around here have been tilled already: waiting waiting for the last freeze. As I was walking around one Saturday looking for something to eat, I saw on two separate occasions long folding banquet tables laid out with snacks and women serving makkolli to lines of men. I’m guessing maybe they were work crews to till each other’s fields? On Tuesdays and Saturdays (and maybe other days?) one of the side streets is blocked off for a street market. I think there is a lot of selling going on. The clothing and other household goods, not so much. But the food? Yeah. One thing I hadn’t noticed at the other traditional markets I’ve been to in Seoul that I see here are big square blocks of fermented soybeans. They’re about 11″ square and about 5″ thick. and have a gray blush of mold on them in some places. I don’t know if they are starters for your own clay jar of soy bean paste, or if you cut off the solids and eat them like cheese or what you do with them. There is one supermarket in town, which has the same name as the bank Nonghyup. It’s not that interesting, so I’ll try and support some of the small mom & pop places whenever I can. But mostly, since I eat at school and there’s not much western food and I don’t really have the time to cook, I just buy fruit, salad, and toast to snack on. All over Korea, though, everyone is accustomed to eating imported fruits out of season. But the vegetables, most of them are local and traditional fare. Once in awhile I see something that reminds me I’m having a cultural experience. Like the guy I saw walking down the hill past my apartment, with a huge stack of wood strapped to his back. Just like those free-standing wooden cradles that men of old strapped to their backs like back-packs, this guy was doing the same. Only I don’t think the cradle was made of wood. Maybe a modern-day metal version of the same thing? And the grandmas who lay out a tarp and sell things here in the country – you can tell these are excess produce from their own winter garden. Unlike the grandmas who sell things in the city, who often have one product they have sourced and re-sell. People here, in general, dress for comfort and it’s rare to see someone in stiletto heels and ten tons of make-up, so that’s a really welcome change for me. The bike shops, too, sell a lot of ATV’s and the used ones have REALLY been used. And the guys. I’ve seen some pretty handsome guys here. Especially the bike gang I passed in Gapyoung. My midwest 70’s upbringing heart skipped a beat when I saw that. I wonder if they’re just a club of guys who know they look good in riding gear, or if they are truly thugs and/or organized crime? Ha ha ha, well I’ll never find out I suppose. I do miss good coffee, though. There’s one donut/sandwich coffee shop that pulls espresso, and it’s o-k. There is, also, at least one (that I noticed thus far) coffee shop. It was explained to me that these coffee shops are actually low budget sort-of hostess bars and that only old men frequent them. They’re from some tea-house tradition that’s been going on for centuries, and it’s run downhill and nobody young would be caught dead going there. Time to run out and find food again. I need to plan /shop for weekend eating better.